Ian Blackwell Rogers as Hamlet. Photo by Rita Baker-Schmidt. One of the joys of seeing Shakespeare in the open air is that it can remove all the nonsense that has plagued the Bard for decades. 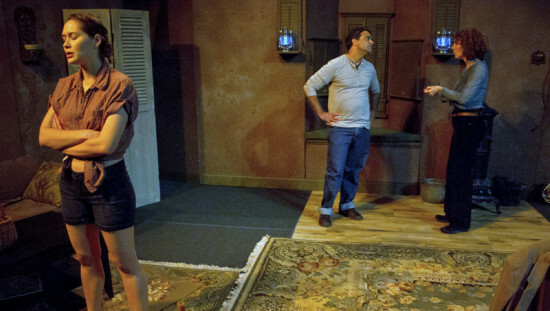 Gone is the hyper-subtlety of the Stanislavski “Method” where actors mumble away and you have to focus on every tiny nuance to understand what’s going on. What you get instead is full-frontal theatricality in an atmosphere where you can see everyone and everything. On any given night on the meadows at Evergreen, not far from our brooding stage hero you’ll find a rambunctious toddler waddling among the folding chairs, ushers lighting citronella torches, not to mention a cameo from the company’s well-behaved, four-legged mascot (auditioning, no doubt, for that next production of Two Gentlemen of Verona). The ready availability of booze, sodas, and snacks completes the picture; this, folks, is theatre as Shakespeare knew it, as Shakespeare wrote it, as Shakespeare intended it. I mention this because when I teach Literature it is a constant struggle to convey the sheer joy of Shakespeare’s plays—for my students the language is impenetrable, the action set too far back in time, and only the occasional film clip can get the slightest spark of recognition out of ‘em. Worst of all there are those infernal labels “GREAT,” “CLASSIC,” “LITERARY GENIUS” hung around the man’s neck like so many scarlet letters. The cast of ‘Hamlet.’ Photo by Rita Baker-Schmidt. One evening with the Baltimore Shakespeare Factory’s production of Hamlet, currently playing on the Johns Hopkins University campus, can show us what drew audiences to the play in the first place. Shakespeare’s company knew the plot twists and stock characters that would draw a good crowd—pathetic ghosts, prurient kings, tongue-twisting commoners, queens of mixed virtue, innocent maidens, cynical pols, plots and counter-plots, international intrigue—not to mention a flashy fencing duel and a high body count to top it all off. And the company makes good use of the natural setting, complete with surprise entrances, to keep everyone in on the action. Heading up the cast is Ian Blackwell Rogers as Hamlet, our immortal Danish prince who is haunted by the prospect that his father may have been murdered, but who is too conscientious to take his revenge without proof of the murderer’s guilt. To hide his suspicions, he pretends madness while trying behind the scenes to get at the truth. Rogers seems to be a character actor at heart—a perfect fit for this role—and he is at his absolute best when relaxed and dealing directly with the audience, or adopting an ‘antic disposition’ that is sheer entertainment to watch. He only stumbles, as many Hamlets do, when he becomes aware that his speeches make up the bulk of the play’s length. Rushing through one’s lines out of deference to the clock is a common symptom of that rare disease hamlet-itis; the only cure is to relax into the role, savor each of its many lines, and leave the director to sweat out that clock business. Ann Turiano shines as Hamlet’s (ex-) girlfriend Ophelia, and is very effective as a melodic madwoman in her final scene (other productions make their Ophelias more mad than melodic, but it still works). theatre as Shakespeare knew it, as Shakespeare wrote it, as Shakespeare intended it. Given the Shakespeare Factory’s outdoor venue, and the lack of walls to enclose the audience, performances at the Evergreen make great demands on the average actor—who for the most part today is given a microphone instead of actual vocal training. Here, un-plugged, you have to be loud enough to resound well beyond the confines of the audience, preferably all the way to the parking area; and yet your voice also has to convey emotion and subtlety. The core members of the Factory Company clearly have the chops required, among them Rogers, Kelly Dowling (Gertrude), Jess Behar (Most memorable as Rosencrantz and Osric) and Amy Parochetti (memorable as Reynaldo and Fortinbras). Meanwhile James Miller—who among other feats performs as both hot-headed Laertes and Player King—has the benefit of several star turns throughout the evening, and clearly holds his own. Joey Sauthoff has created a serviceable and flexible stage area, complete with curtained entryways that serve to speed the action; meanwhile April Forrer has created wonderful period costumes, some of which (for the women especially) might even be street-worthy. Perhaps it’s petty, but as an actor-combatant of old the only false note I see in an otherwise good production is the decision to use broadswords instead of rapiers and daggers for the final, and famous, duel between Hamlet and Laertes. The introduction of a Medieval battle weapon into what is supposed to be a Renaissance sporting bout seems cumbersome, and Dan Burke’s fight choreography is slowed by necessity because of the broadsword’s weight and its extra demands on the combatant. I would hope future productions can return to the lighter, subtler, quicker and ultimately more thrilling fights of the original. Running Time: 2 hours, 45 minutes, with an intermission. 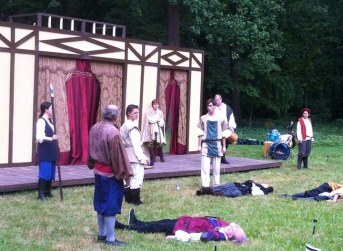 Hamlet performs at Johns Hopkins University’s Evergreen Museum & Library, 4545 N. Charles, Baltimore MD, through August 9. Tickets can be ordered by calling 410-921-9455 or online.